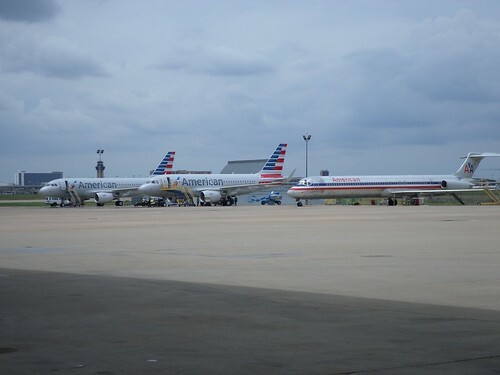 American took delivery of their first Airbus A319 a couple of weeks ago and yesterday they hosted an event at DFW to show off the new plane. The A319 will begin service in mid-September. 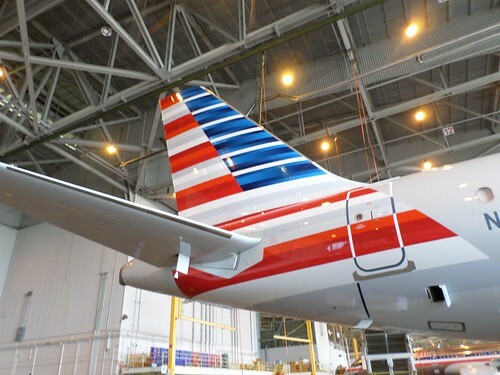 Between now and then American is completing crew training, performing maintenance checks and tests, and installing safety equipment like life vests and medical kits. Once passengers get a chance to ride in the new plane, they’ll notice many new features that make the A319 more comfortable and modern than the MD-80s and 757s that it replaces. 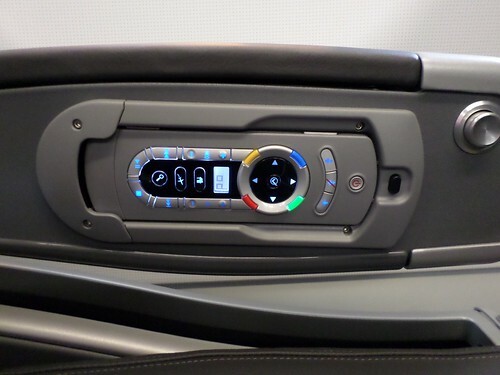 Customers will also notice that the interior has a whole new upscale look: the colors and materials have a lot in common with American’s new flagship 777-300ER. 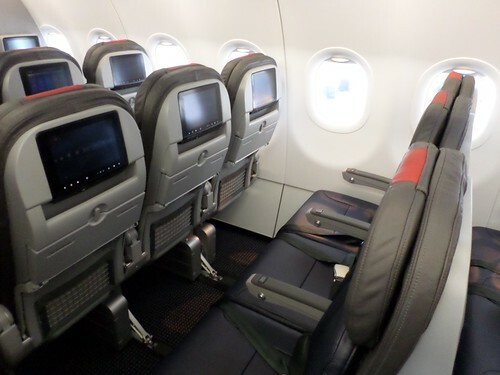 The A319 is American’s first narrowbody aircraft to feature in-seat entertainment throughout the plane. 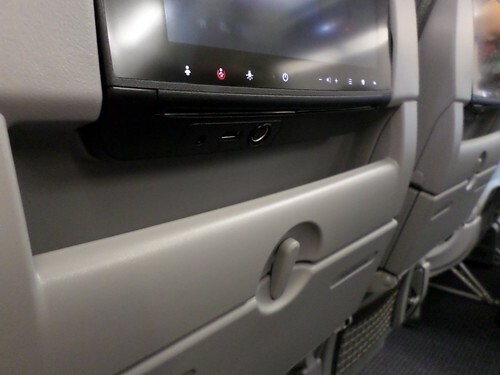 Passengers will be able to choose from up to 200 movies, 180 TV shows, and more than 350 audio selections (including audio books, which I think is kind of cool). 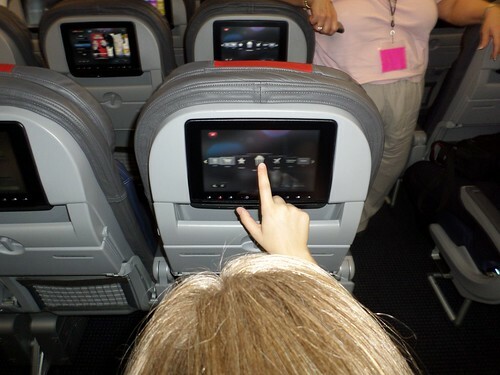 First Class customers will be able to watch on a 12.1-inch HD-capable touchscreen monitor. Main Cabin passengers will be able to enjoy programming with a 8.9-inch HD-capable screen (thanks to Steph from the @AmericaAir team for the IFE demo!). 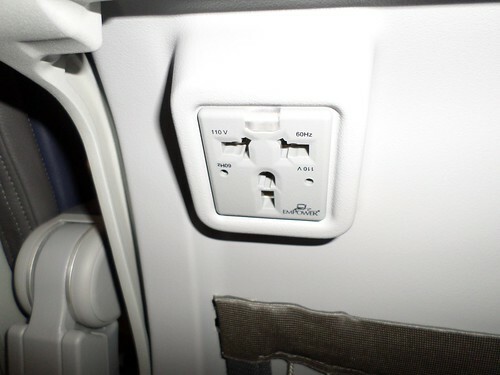 The new plane will be able to keep you charged and connected with universal power outlets and USB ports at each seat, and Gogo’s nextgen Wi-Fi service. 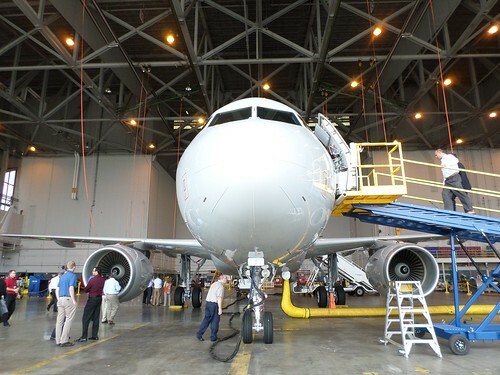 The A319 will be the first aircraft type in American’s fleet to use Gogo’s ATG-4 Wi-Fi solution. ATG-4 uses more antennas and better data compression technology to provide more robust and reliable service. ATG-4 is able to deliver up to 9.8 Mbps of bandwidth per plane as compared to the 3.1 Mbps offered by existing Gogo technology, so it will feel like you’re using a hotspot at a Starbucks instead of on a plane. (I learned that American is working to upgrade their other aircraft to ATG-4). 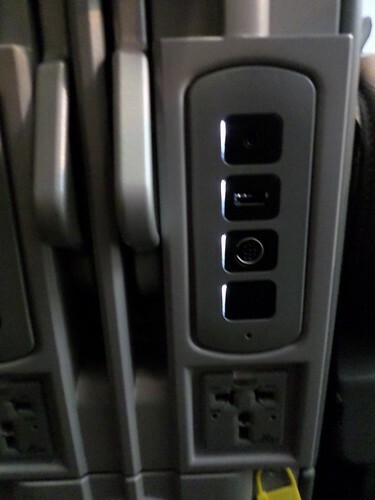 And just like the 777-30ER, the A319 offers an eXport connection at each seat which will enable you to connect, control, and navigate your iPod or iPhone using the entertainment system menus. The new A319 is a big upgrade from the MD-80 and 757 that is replaces. 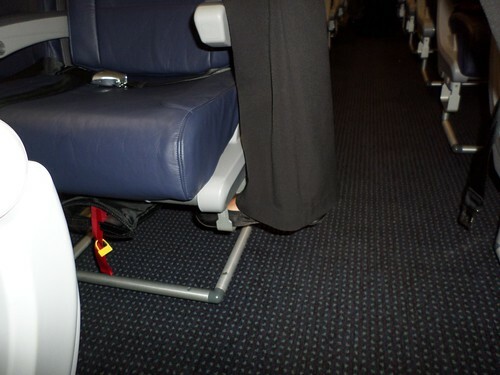 The seats in the Main Cabin are designed to provide more room for your knees: the magazine pouch has been moved up higher and seat backs are shaped so as to carve space for your legs. Leather seats in the Main Cabin (a first). 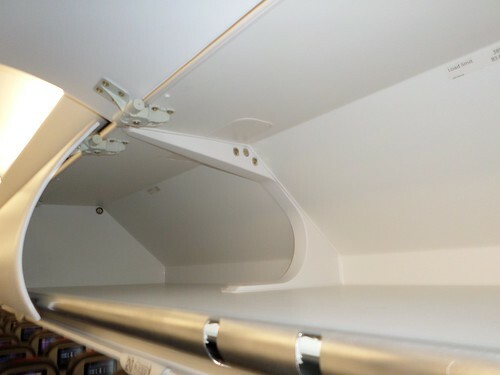 And unlike the MD-80, full size overhead storage on BOTH sides of the plane! Nice design touches like this seat rung to help people reach the overhead storage (Thanks to Whitney from the @AmericanAir for the demonstration!). 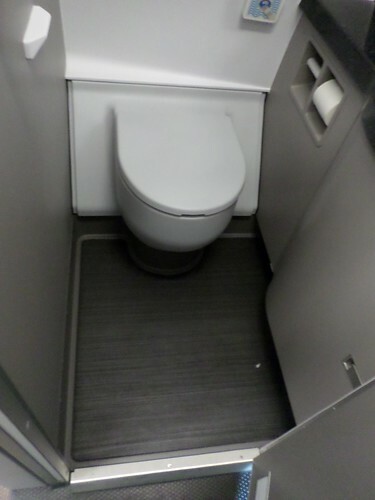 First Class gets an upscale look with grained floor covers, and a faux marble counter. 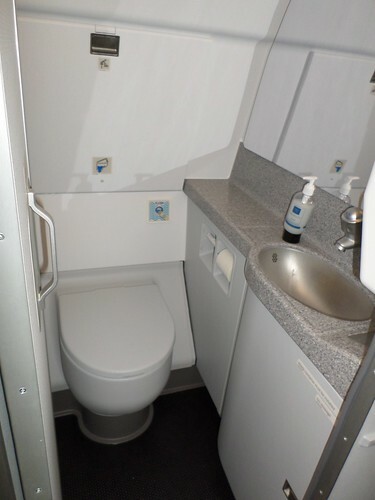 There are two lavatories in the Main Cabin. 5 – No More One Hand Rinsing!! 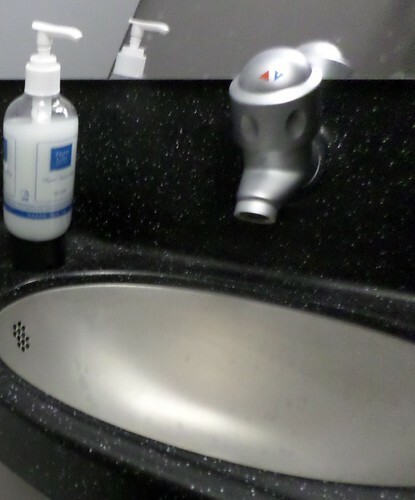 A big improvement over the MD-80 and the 757 is that the new plane uses a timed flow faucet – so no more needing to activate the water with one hand while trying to rinse the other! 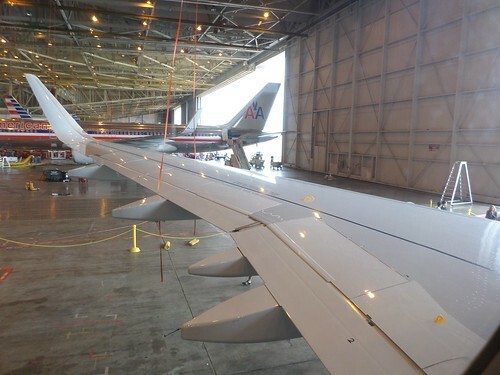 American’s A319 is the first with A319 with Sharklets wingtips. The Sharklet design increases the wing’s efficiency so that it burns less fuel. What could be more important than an alert pilot? 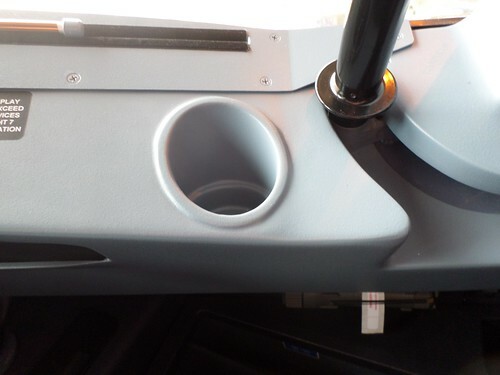 The new A319 features cupholders in the cockpit that are large enough to accommodate a Venti sized coffee from Starbucks! 8 – More on the way! American plans to take delivery of 260 Airbus aircraft from the A320 family during the next few years, so they have many more on the way. Parked in front of the hanger were two more A319s! • Beginning Sept. 16: Charlotte, N.C.; Cleveland; Memphis, Tenn.; Wichita, Kan.
• Beginning Oct. 1: Dayton, Ohio; Huntsville, Ala. Thanks to American Airlines and the @AmericanAir team for the tour and the ice cream! Only eight First Class seats? It may be tough to get upgraded. @ Markj – Hopefully on flights to those smaller market it’s won’t be much of an issue. I know that when I fly to OKC it’s usually just me and two other in the F cabin. @ patricia – I was writing about the MD-80, that’s the plane that offers three seats on one side, and two on the other. 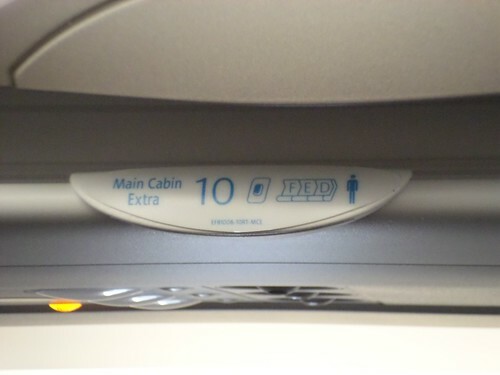 Because of the planes design, only one side of the plane has full sized storage space. American’s other planes have offered full size storage for years. 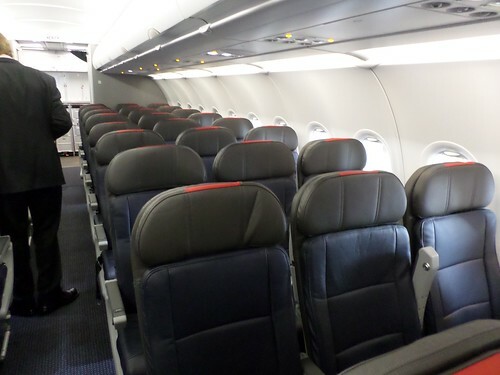 As an Exec Plat, I am not happy about this change – on virtually every MD-80 I have been on, the first class cabin has been full, usually with many EPs and Platinums still on the waiting list. With first class now going from 16 seats to 8 seats, now complimentary upgrades will be VERY far and few between, even for EPs. 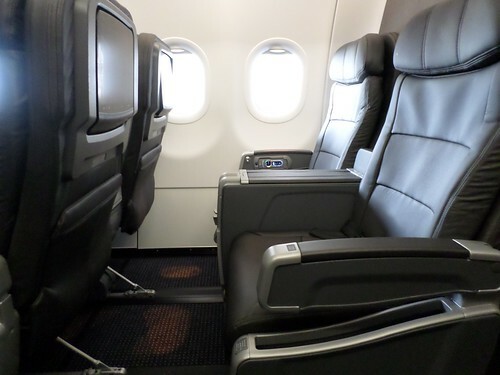 Eight worst features of the new American Airlines A319: each first class seat. As an EXP, I don’t like the reduced number of F seats, but overall this a huge improvement from the venerable Mad Dog. 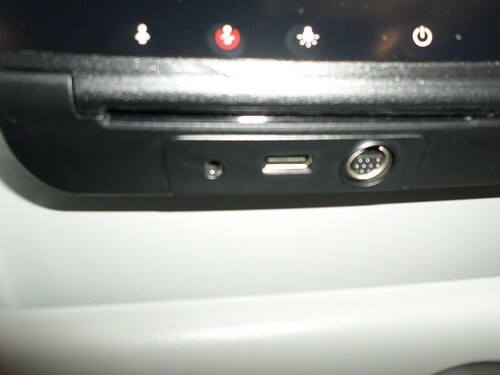 Did anyone from AA mention if AVOD is complimentary in Coach? 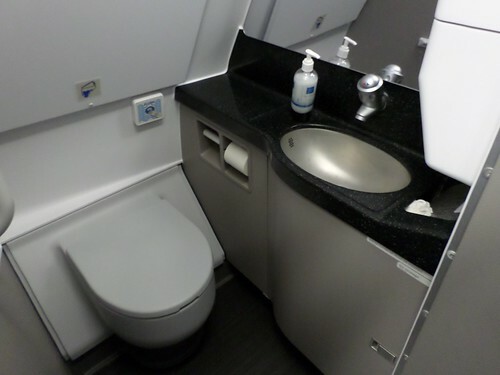 @ MichaelT – It will be interesting to see if AA makes any changes to the number of seats in the F cabin on future 737 deliveries. @ Kris – That’s funny! Customers will have the option of complimentary content, pay-to-access packages or pay-per-view movies in the Main Cabin. Customers will have the opportunity to preview TV programs, music and games on the ground before purchasing right from their seat via credit card. • Complimentary content includes NBC Universal Television, 18 American radio stations and a collection of short content videos. 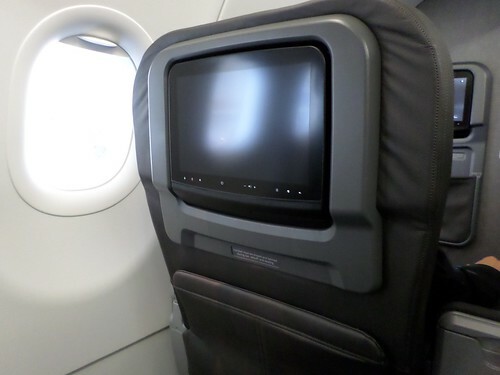 • Starting at $4, customers can access packages of more than 150 network and premium television shows, 300 albums, audio books and games, and up to 200 movies on longer flights all on-demand. 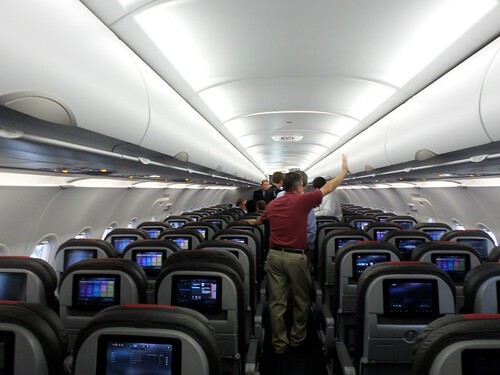 • The A319s will feature a new content library called Disney Family Room. For one price, customers can access a package of movies, television programs, music and more from Disney. 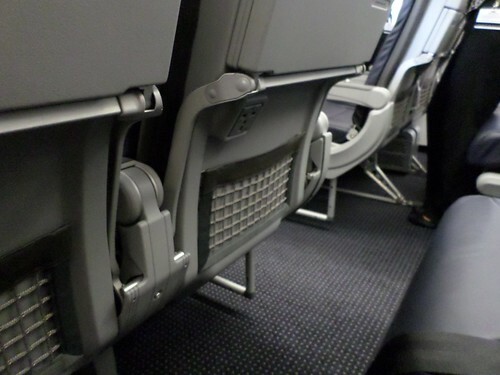 Looks like slimline seats in Y.. Do they have decent padding? Do you think, if the merger goes thru that Parker would make these birds fly only international and use the existing us airways birds on domestic flights? Like that they don’t have to spend so much money to upgrade the fleet. Or will he upgrade his fleet? Thanks, love your posts! Forget about getting upgrades or award seats in F. Some cities and routes it will be serving are neither small (CLE and YYZ) nor have short routes (YYZ-DFW at 3 hrs. and 35 minutes). This is just ridiculous that they would order aircraft with just 8 F seats if they are still interested in keeping AAdvantage as a premier frequent flier program. If the passenger in the seat in front if you reclines, forget about being able to see the video screen. 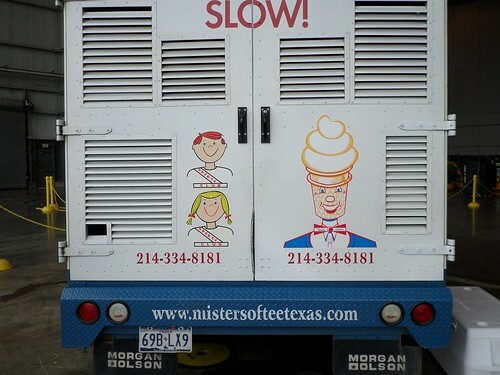 Unless you like to watch from 8″ in front if your face!